Ice to meet you use only 100% raw materials in our range. Every care has been taken to ensure delivering only the finest quality products. Our great selections are processed with the isothermal treatment. Ice to meet you has been accredited by the British HACCP, and all products produced under HACCP conditions ensure the safety and health of the food material. Ice to meet you are committed that all the package of our products is selected by the newest technology, locked fresh to ensure the safety and reliability of the products. We believe everything we do goes into everything you taste. We guarantee to pack for freshness, convenience and happiness. Tips: Once opened, please consume immediately. However if the package seal is open or damaged, do not consume. Ready to eat, Contains Bones. Consume soon after opening. 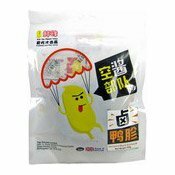 Ingredients: Duck Gizzards (95%), Water, Soy Sauce (Water, Soybean, Salt, Wheat [Gluten] Flour), Salt, Sugar, Bay Leaf, Rice Wine (Wheat [Gluten]), Sichuan Pepper, Star Anise, Flavour Enhancer (E621), Ginger, Spring Onion. Simply enter your details below and we will send you an e-mail when “Marinated Duck Gizzards (鮮鋒鹵鴨胗)” is back in stock!